Residents begin cleaning up their homes in Cabanatuan, Philippines, October 20, 2015, two days after Typhoon Koppu battered northern Philippines and flooded Cabanatuan city and nearby provinces. A lumbering cyclone that left much of the northern Philippines inundated has been downgraded to a tropical storm, but a handful of provinces remain under weather warnings. And the areas in Tropical Storm Koppu’s wake suffered heavy damage. Officials are saying the storm killed at least 17 people. The storm, which hit land as a category 4 typhoon, is headed towards tiny islands on the northern-most tip of the Philippines. It is crawling at four kilometers per hour. And some northern and central areas are starting to see better weather. “There are areas that water is going down but then there are areas that water is getting higher because Cabiao is the catch basin of all this because we are [on] the lowest [lying land] in the whole of Nueva Ecija,” she explained. The Pampanga River bisects Cabioa and the farming town’s edge is right next to Mount Arayat. Koppu’s rains bloated the river, which overflowed completely submerging nine villages in Cabiao alone. The downpour also sent cascades of water down the slopes of mountains, sparking flash floods. The Civil Defense office said at least 100 national roads and bridges have been affected by landslides and flooding. 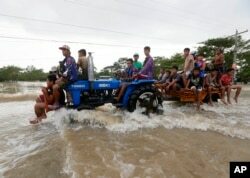 Commuters ride a farm tractor as it maneuvers through strong floodwaters along a highway in La Paz township, Tarlac province in northern Philippines, October 20, 2015. The storm, now with a 650-kilometer cloud span, dumped half a month’s worth of rain in a 24-hour period in many provinces. Koppu’s winds downed power lines, uprooted trees and blew roofs off lightweight houses, churches and at least one hospital. The disaster risk reduction council said close to 300,000 people have been affected by the storm, with about 71,000 staying in shelters. Power remains out in five provinces. Philippine Red Cross spokeswoman Gwendolyn Pang said the agency is particularly concerned with several isolated towns in central Luzon. “As I said many areas are still not accessible, so we are still exerting a lot of effort, making sure we are able to penetrate and go to those areas,” she said. President Benigno Aquino passing out relief goods Monday told reporters the government is trying to send aid to several towns cut off by landslides but clearing away the debris will take time.